Author(s): Ban-An Khaw, Northeastern University, 360 Huntington Ave, 140 The Fenway, Rm. X138, Boston, MA 02115, USA. Jagat Narula, William Hartner. Background: Tc-99m labeled Glucaric Acid (Tc-GA) and In-111 labeled human fibrinogen (In-HF) were used to demonstrate reduction in myocardial infarction and microvascular injury in rabbit preconditioned ischemic hearts. Methods: New Zealand White rabbits were subjected to preconditioning or non-preconditioning ischemic myocardial injury. Reperfusion was established after 45 min of circumflex occlusion and then Tc-GA and In-HF were injected intravenously. Anteroposterior gamma images were acquired for 4 hours. Perfusion defects, histochemical infarct size and radiotracer uptake were determined. Results: In vivo and ex vivo images were consistent with the gamma scintillation counting data. Minimal GA and fibrin depositions were seen in preconditioned ischemic hearts (3.78± 10.7 and 0 % of total myocardial area respectively) whereas the areas delineated by GA and fibrin deposition in non-ischemic preconditioned hearts were larger (61.9± 34.5 and 60.0± 32.7%). 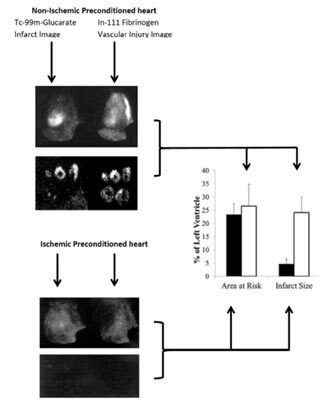 Infarct size of preconditioned ischemic hearts was 4.6±1.9 % of the left ventricle, whereas that of non-preconditioned ischemic hearts was 24.1±5.9% (P <0.01) assessed by histochemical technique. Infarct size from imaging was approximately 2.5 times that of the histochemical assessment. The regions of perfusion defect were similar (23.3±4.1 vs 26.5+8.5% respectively). Images of Tc-GA uptake and In-HF deposition were consistent with histochemical and radiotracer uptake data indicating minimal myocardial injury in preconditioned ischemic hearts even though areas of perfusion defect were similar. Conclusion: The data indicates that ischemic precondition not only preserved myocyte viability but also reduced microvascular injury. Keywords: Gamma imaging, histochemical infarct assessment, myocardial ischemic preconditioning, myocardial microvascular integrity, radiotracer. Affiliation:Northeastern University, 360 Huntington Ave, 140 The Fenway, Rm. X138, Boston, MA 02115, USA. Keywords:Gamma imaging, histochemical infarct assessment, myocardial ischemic preconditioning, myocardial microvascular integrity, radiotracer. Abstract:Background: Tc-99m labeled Glucaric Acid (Tc-GA) and In-111 labeled human fibrinogen (In-HF) were used to demonstrate reduction in myocardial infarction and microvascular injury in rabbit preconditioned ischemic hearts.